Applecross Rotary will start collecting non-perishable groceries to donate to hungry families in Perth. Donate items like the ones pictured in this photo (nothing costs more than $4 and many of the items cost a dollar or less). This project - “Giva Damn, Giva Can” originated in one of the Bunbury Clubs, and will be part of the Community Service Committee activities this year. 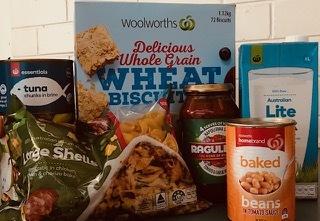 Clive Pearson is looking for someone to be the person who collects and stores the food donations and I, Ian, will ensure they get to Foodbank or another emergency food provider such as Coastal Emergency Services at Mandurah - we all know a few people who have moved there recently!